I hope you're looking forward to the week ahead! I just got back in from a trip out to Maine which was very beautiful this time of year. However, it wasn't the fall foliage that got my attention. It was all of the fresh, skin healthy produce that is available this time of year. These food items that can really make a dramatic difference in how you look and feel. I'm reminded of this as so many of my clients don't realize how important this is along with what you put on your skin. So today I'm going to talk about feeding the skin from the inside and the outside, because this is a great time of year to address both! Want To Look Great This Holiday Season? Then, you need start focusing on what your skin needs now. Don't worry, it's easier than you think! I write extensively on the benefit of adding certain foods to improve the health and look of your skin from the inside and out. This is not just an idea about how to improve your skin, it really works. While on this last trip I was surrounded by nature in some of its purest forms. Maine is the land of two of the most important and healthy berries (for your skin and otherwise) you can eat. They are the blueberry and the cranberry. Blueberries are my favorite and you can guess I brought back fresh ones to enjoy over the winter. inflammation and sensitivity. The power of their antioxidant content has been scientifically proven to work. This fall you can really beef up your immune system and help your skin by making sure you add all of these great foods to your weekly diet. 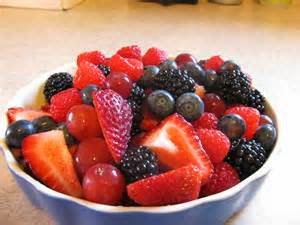 The high-antioxidant content of blackberries, blueberries, and strawberries yield countless healthy-skin benefits. Cranberries help to balance out the acidity of the body out as well. Did you know that foods like artichokes, beans, prunes, and even pecans and walnuts are packed with antioxidants as well? Fresh carrots are loaded with vitamin A, which again will help balance the pH of your skin's surface, making it more able to keep harmful bacteria at bay. A recent report by the National Cancer Institute found that those of us with the highest intakes of carotenoids—pigments that occur naturally in carrots were six times less likely to develop skin cancer than those with the lower intakes of this vegetable! The skin healthy ingredients in these foods are the essential fatty acids we all hear so much about. They not only block harmful irritants, but also act as the passageway for nutrients coming in and out, and for waste products to get in and out of the cell. I write a lot about this. You MUST stay away from hydrogenated and trans-fatty oils. The best oils are those labeled cold-pressed, expeller processed, or extra virgin meaning they have not been heated or hydrogenated. But remember even healthy fat is high in calories, so limit yourself to two tablespoons a day at most. This may seem like an odd combination of items, but these foods are rich in the mineral selenium, which plays a key role in the health of skin cells. They are necessary for good skin and studies show that skin damage caused by the sun may have fewer consequences if selenium levels are high. Vitamin A is one of the most important components of skin health, and fall produces a great many foods such as pumpkin, squashes, and sweet potatoes (in moderation) that are full of this necessary vitamin for healthy skin. Right now they are as close as your supermarket or your local fall vegetable stand, so make sure to take advantage while they're available and fresh. While I was in Maine I found a shop that had blueberry infused green tea. Tea IS GOOD for you! The skin-health properties in this drink are completely unmatched. It has anti-inflammatory properties, protects your cell membranes, and has been shown to (potentially) reduce the incidence of some cancers. It's also a key to keeping a balanced body weight. Did you know that just sipping on hot tea can also boost your metabolism? These tiny seeds pack the most natural vitamin E of any food around. And, no antioxidant is better at slowing down the aging of skin cells to keep you looking younger longer. They are easier on your body than vitamin E supplements and they taste great too. This should go without saying but I am going to say it anyway. Drink plenty of water! This could mean anywhere from 6-8 cups (normal recommended) to up 16 cups of water each day depending on your level of physical activity. Hydration is key to healthy looking skin, and there's nothing better to compare than water to flush out toxins, keep things moving along in the digestive tract, and keep your skin resistant to stress from the environment. By using this as a guide to round out your diet, you will improve the very cells your skin is producing today that will determine how you look in your tomorrow. It's an investment of time and a choice that can dramatically make a HUGE difference. Want to see an almost instant and dramatic difference in your skin right away? I always like to give you more access to information that you can use today, so visit the next link below to learn the 5 Best Foods For Better, Glowing Skin.